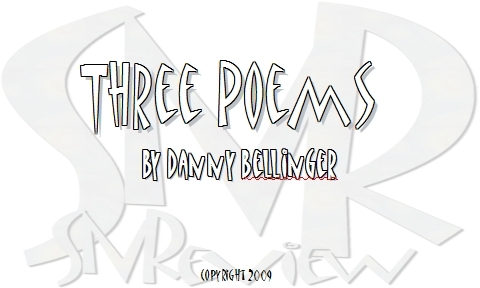 Copyright 2009, Danny Bellinger. © This work is protected under the U.S. copyright laws. It may not be reproduced, reprinted, reused, or altered without the expressed written permission of the author. Danny Bellinger is an Adjunct Professor in the Department of English at Clark Atlanta University, and Director of the newly formed Spoken Word Institute for Global Learning at Morehouse College in Atlanta, Georgia. His poetry has appeared in numerous publications including Pitkin in Review, L-I-N-K-E-D (online), The Wandering Hermit Review, Quay Journal, Borderlands: Texas Poetry Review, Holly Rose Review and an upcoming issue of Blue Collar Review.